Paper Crafts by Candace: Jaded Blossom Stamp Release Blog Hop!!! Hi Everyone! And welcome to the Jaded Blossom Stamp release blog hop! This month is just a mini release but Michelle and I were just to excited about our new die that we had to release it ASAP! If you did not come from the Jaded Blossom blog and would like to check out all the releases please click here. As always I have a couple of projects to share with you! This first one is a card I made using the smaller of the Flag Dies. 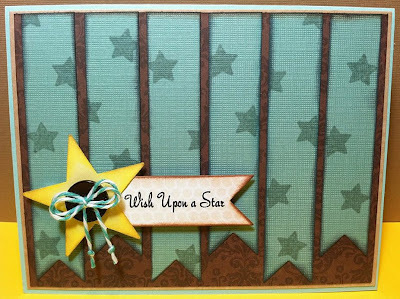 I cut out the aqua/teal paper and then stamped stars on it from the Miscellaneous Fun stamp set. I also cut another flag out using ivory patterned paper and stamped "Wish Upon a Star" on it which is also from Misc. Fun stamp set. Second project I have for you is a tag! Again I used the small flag die and "Eat Me" is from Food & Drink stamp set. I was inspired by Alice in Wonderland :) You could attach this tag to a treat bag or cupcake box etc! And for the third project I created a sour cream container. This would be a perfect little favor for a Wedding or a shower! I used the stamp set "Babies & Weddings" and the small and big flag die along with adding some flowers at the top. I am just in love with this flag die!! Its so nice and convenient! So, which is your favorite project? Mine is the sour cream container. Sooo shabby chic! Next up on the hop is Ruthie!! Dont forget we have prizes so make sure to comment on all the DT's blogs! Love the card with the die!!! See many great ideas coming for this release!!! I LOVE your last project!!! Super cute Candace!!! I like them all but "eat me" reminds me of someone I know so i pick that one;) I'm subscribing too - like your work!!! Great job. tooo cute chickie love the wedding favor for sure !!! Awesome release, awesome dies and what a great way to start a weeknd, well sort of, right?- than with a hop. Love your projects. Wish upon a star is my favorite. What a Great idea, Love the flag die!! !My favorite is the wedding favor. Wow! Great projects and ideas! TFS! I'm loving you guys stamps!!! Great projects. I'm getting inspired from this hop. Candace, u r 100% right! That flag die is pure awesomeness!!! Love all 3 projects! TFS. Love the new die and these stamps sets are just too cute and so are your creations. I especially love the favor so pretty. I love the sour cream containers! Love all your projects. 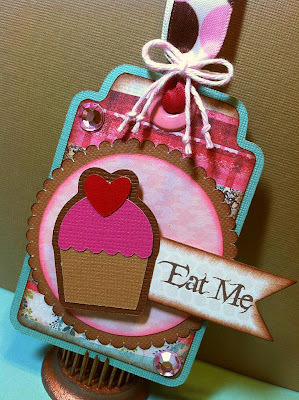 The card is super cute, love the cupcake on the tag and the favor is really cute, great for any party favor occasion. I'm really liking the new banner die. What awesome projects! Already ordered these are sooo great! The use of the flag die on the card is wonderful. It looks so pretty. As do all the other projects. Thanks for sharing. Candace, I love your "Alice" inspired tag, it's gorgeous!! Your sour cream container is so pretty too, especially the pink roses!! Great projects. Amazing release. Thanks for the inspiration. Love your projects and the flag die...what an awesome idea. Oh my, all your project are so darling!! I just live them all.. Darling projects! Love the flag dies. All of your projects are adorable! Oh my! I can see me spending some more $$ right now!!! LOVE THEM!! Love your projects. Love the March release. Your cards are really cute, thanks for sharing them. I always love everything you do! So glad I follow you on facebook and pinterest :o) Love the Wish card!! I love the flag die too!!! I can't wait to order it. :) my favorite is the card, but they are all really awesome! You did such a great job using he diecuts. Thanks. that new flag die is AWESOME! I love the sourcream container too .... cuteness! Love your tag. Great colors and imagination. Thanks for your talent. My favorite is the tag! Great projects. They are all cute, but I like the tag the best! Awesome! Great uses of the die!! Love your shabby chic sour cream container!! I love what you did with the new flag dies! So very creative! I am inspired! This flag die set is the best. I love your tag...it would make the perfect topper to any gift. Way to go Candace!!! Love the stamps set!!! Beautiful projects!! These flag dies are so cute ... Love your projects! Really cute projects. Love the use of the die cut. Love your projects! Great job showcasing your new stamps and dies! Your projects are absolutely adorable! I'm a new follower! I'm really loving that flag die! I love your projects, very cute! 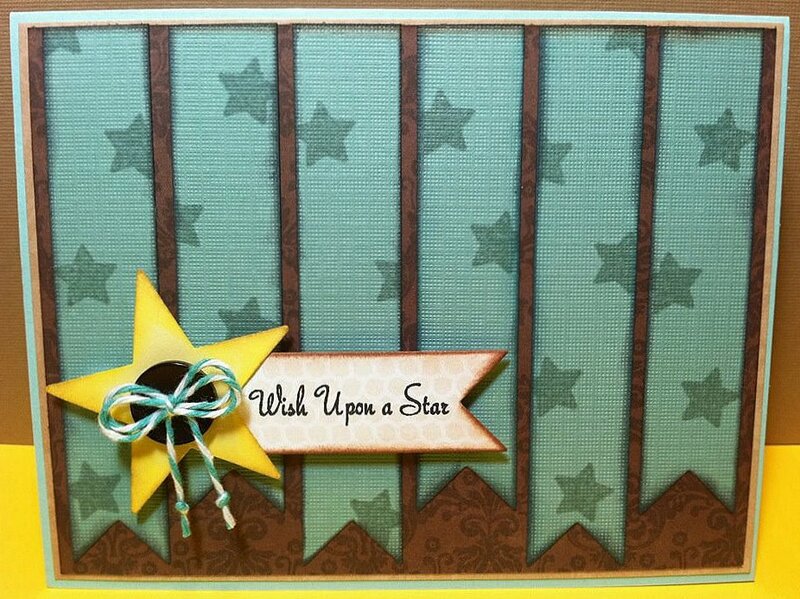 I absolutely LOVE this star card and will be recreating it in pink and brown LOL. Too cute!! The new flag dies are fabulous! It's my favorite - and the star card! All three great projects. My favorite is tge Eat Me tag. I love the colours. You always do amazing work! Oh my gosh, super cute projects, hard to pick a favorite. I really like the sour cream container, maybe because we have a wedding in June (time is flying!). Also, I love your blog design, the owls are adorable. ♥ all your projects Candace!!! But my fav is the wedding favor! Love all of the projects, but the tag is my favorite!